relations | Where is @rusnivek? 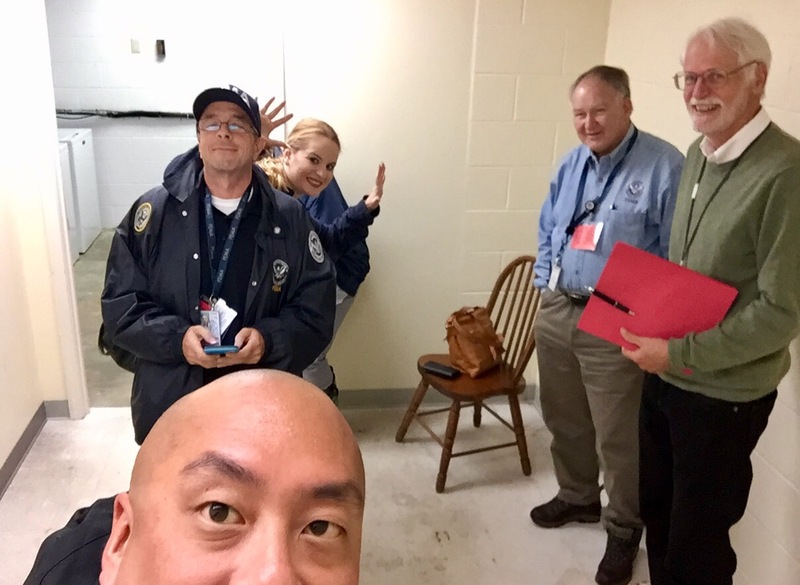 Late night briefing….in the laundry room. Yes, it’s true. The “glorious” life of a Public Information Officer. 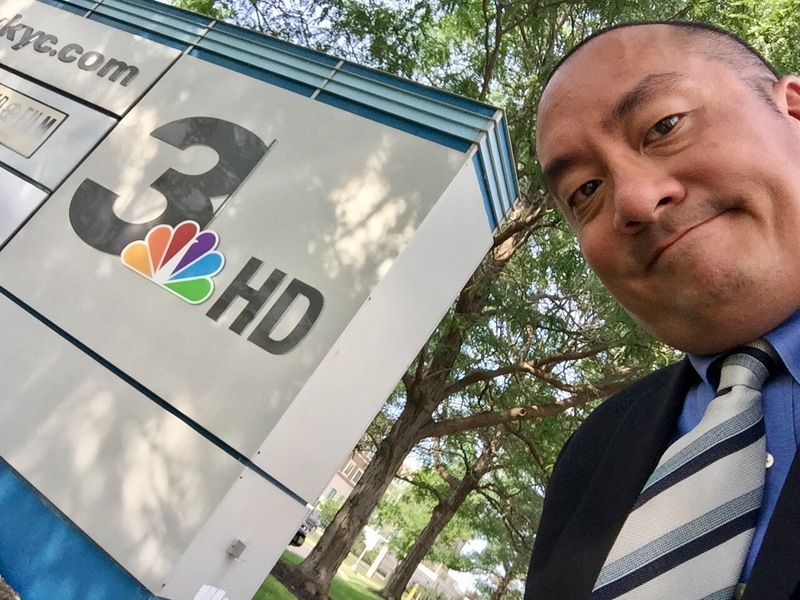 JIC Manager, Media Relations Manager, News Desk Specs, and PIOs – bring it in! Welp, Saturday plans will have to look slightly different now. Better mount up as I *think this is for Texas. Well, I don’t *think I’m going to need my tie, but definitely my best pair of boots. 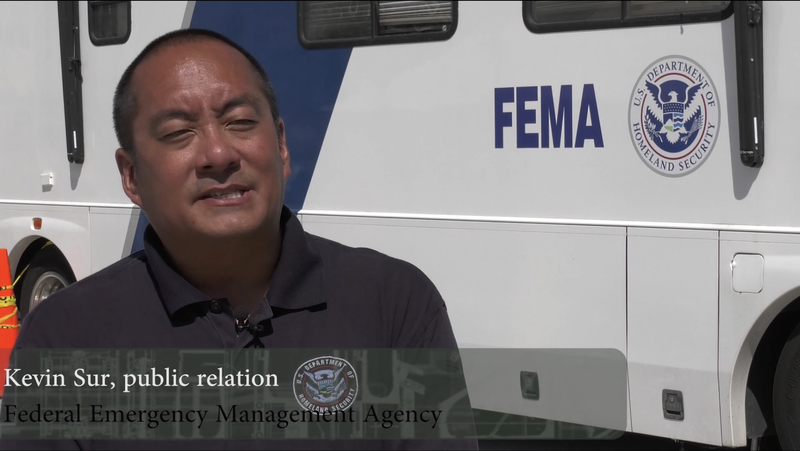 Incident Management: External Affairs Media Relations Spc…aka PIO! 15-002: Tornado or ICBM launch? Pictures are such an important part of every social media post. Instagram is mainly based on pictures and hashtags to engage all users. This was evident when Orange County’s Emergency Preparedness team posted this on their Instagram feed. To the untrained eye, it does seem like a severe microstorm/cloud/tornado. However, the picture shows a launch of a rocket pulled from google images or desktop computer wallpaper. 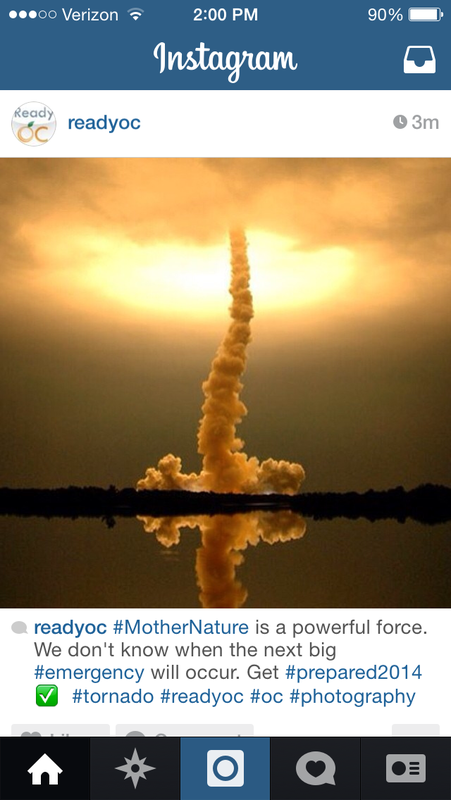 Furthermore, this post could also be misconstrewed as a missile/ICBM launch or an attack on US soil. Finding original content is tough, but professionals take the time to discern the little details in the pictures to showcase the safety theme and share actionable information. It is our duty to correctly inform the public on dangers that we encounter. We also must strive to provide actionable information with our engagement digital strategies. If ReadyOC used the correct picture of a tornado, adding safety tips to the post (like those featured below) could have enhanced their theme. Right now, the hashtag #photography is unnecessary because it doesn’t relate to the post. Remember social media, especially Instagram, is a visual medium. Your reader’s Instagram feed space is at a premium. The correct picture will draw readers into the picture and (possibly) click the link in the profile. You don’t cause panic by showcasing a missile launch and calling it an #emergency. You use Instagram’s prime digital real estate to share good hashtags to find great information. Time is valuable, so gram good stuff. Speed is primarily the reason why everyone loves social media…especially Twitter. 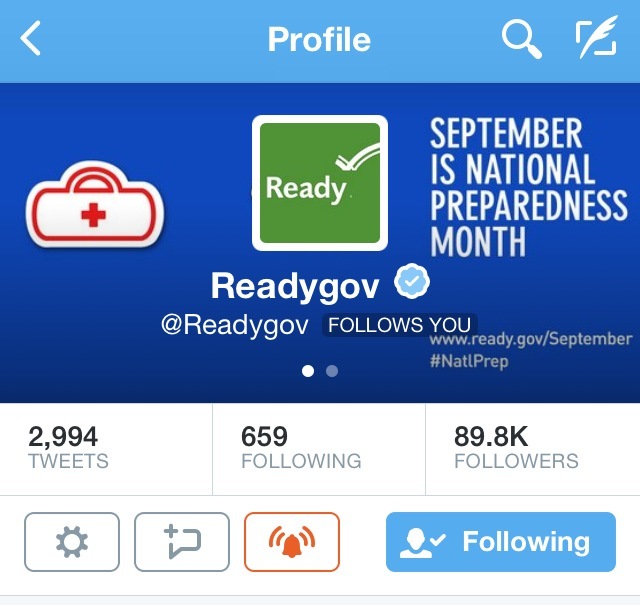 Many agencies use social media to provide updates and information when assigned to certain incidents. 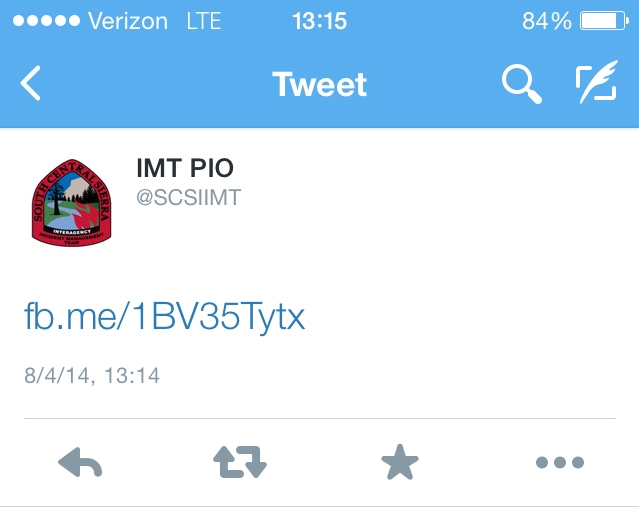 That’s what the South Central Sierra Interagency Incident Management Team did during the French Fire in California when they pushed this lonely shortened Facebook link out on Twitter. I get that 140 character max on Twitter is short…and you have lots to say…and you don’t have time…and blah blah blah. Everyone else doesn’t have time too. But pushing a non-descript link, does raise a concern that perhaps your account has been compromised by spam bots. Your agency has worked diligently to establish solid working relationships. During an emergency is the WORST time for your audience to question and/or ignore your official accounts with trusted reliable information. If your social media plan calls for directing all efforts to Facebook as the primary source of information, a Public Information Officer (PIO) should still take the time to provide a little information (like a short description) on other platforms driving the traffic to that primary source. Providing just a link is not enough. In the PIO business, we are forced to be precise, however just providing a link pertaining to a dangerous situation or disasters will not be enough to satiate the Twittersphere’s social interest. Audiences change on various social media platforms, however, many agencies *think* they are all the same. 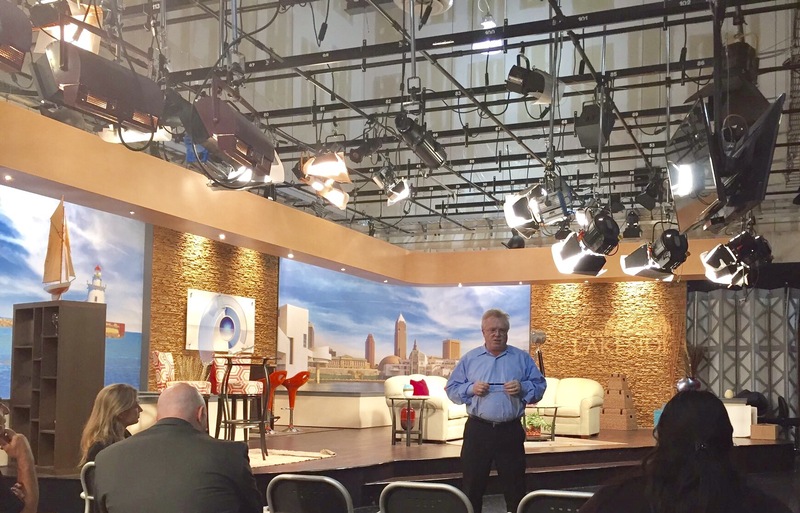 Knowing your audience is the hallmark of success. If you pair your Facebook and Twitter accounts to save time and to pass the exact same message – you should consider separating them now. Remember, you write/post/share information differently on various social media platforms. You have more visibility by informing your followers that your team is still assigned to the incident. The link looks less spammy and readers know what the specific content is in the link. 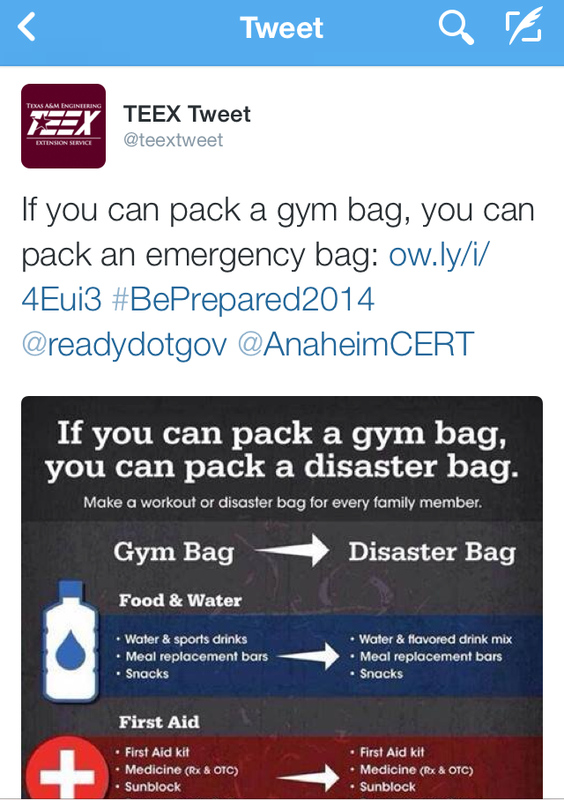 Your #hashtag will give more information about the current overall disaster/emergency. Your readers are likely to click on this hyperlink because it will take them to a picture. People love pictures.